Baking chicken breasts was my culinary Achilles’ heel for years. I could truss and roast a whole chicken with my eyes closed and it would always come out perfect, but when it came to something as basic as baking chicken breasts, I was at a loss. Even if you’re a total beginner in the kitchen, you can master how to bake chicken breasts. And after you do, you’ll be able to master hundreds of healthy recipes, from salads to soups to sandwiches to dinner any night of the week in less than a half hour. 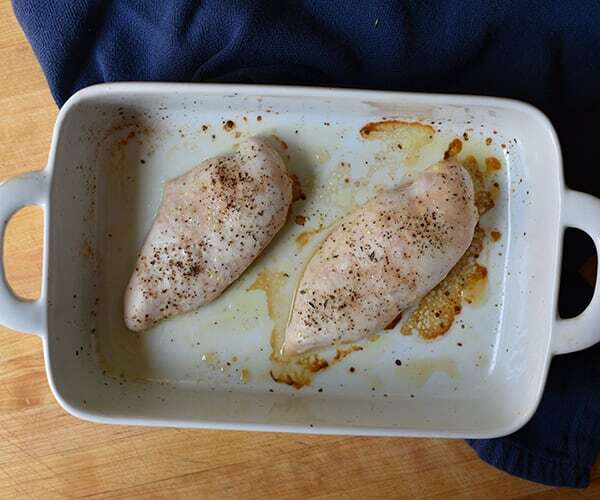 There are lots of ways to make great baked chicken breasts, but this simple, no-fuss method is a great place to start. Sometimes chicken from the butcher’s counter may still have the tenders attached (that’s the thin strip of meat that runs along the underside of the breast, making one side much thicker than the other). Remove these with a knife and save them for another meal. I like to freeze them, and when I have enough, I make these Almond Crusted Chicken Fingers. While the oven is heating up, pat each chicken breast dry with a paper towel. Don’t wash your chicken breasts in the sink — you can easily spread germs to dishes, utensils, and other surfaces of your kitchen. And make sure you wash your hands thoroughly after handling raw poultry, as well as any cutting boards, knives, etc., that it came in contact with. Drizzle each chicken breast with about a teaspoon of olive oil. You can also squeeze a lemon or lime over the meat to give it a little extra moisture as it cooks. Chicken breast meat has a reputation for being flavorless, but it tastes wonderful when properly seasoned. Try a pinch of dried rosemary or thyme, paprika, or a spice rub like this taco seasoning. It doesn’t take long to bake chicken breasts, but you’ll find that thicker pieces of chicken will require more cooking time. Check the meat after 15 minutes. Pierce the meat with a toothpick or the tip of a knife. If the juices that run out of it are clear, it’s done. If the juice runs pinkish or red, pop the chicken back into the oven for a few more minutes. 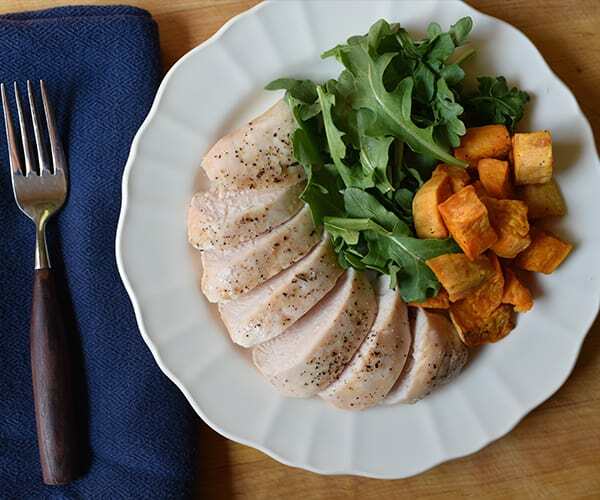 The U.S. Department of Agriculture recommends cooking raw poultry to the internal temperature of 165 degrees F. If you want to be doubly sure your chicken is cooked correctly, you can use a food thermometer. By doing this for a few minutes before you serve the chicken, it allows the juices to settle back into the meat. If you plan to cook more than two chicken breasts, just use a larger baking dish, and leave plenty of space around each piece of meat. You do not need to increase the cooking time. For perfect baked chicken breasts, follow this recipe to learn how to bake chicken in the oven that succulent and delicious. Place chicken in ovenproof baking dish. Drizzle chicken breast with oil. Season with salt and pepper if desired. Bake for 15 to 20 minutes or until chicken is no longer pink in the middle and juices run clear. Cooking times may vary depending on the thickness of the chicken breast. 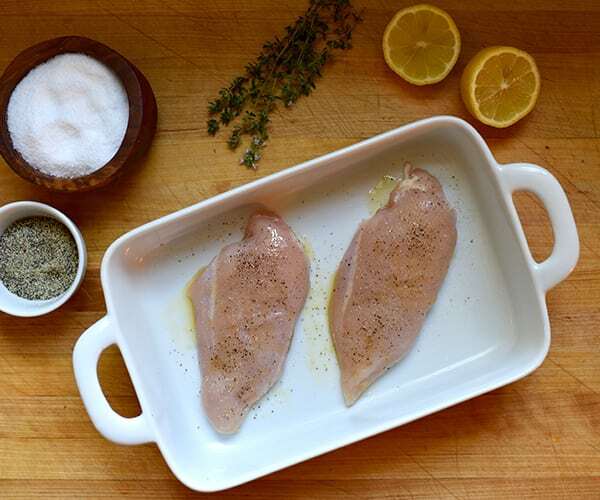 You can also season chicken with lemon or lime juice and dry herbs like rosemary and thyme. Makes a great protein as part of lunch or dinner. 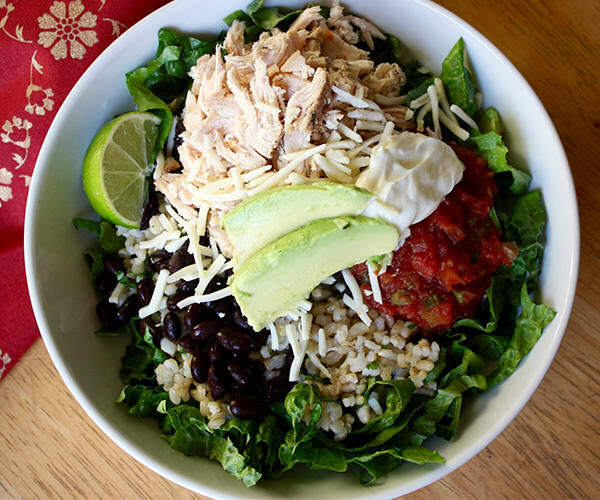 Find out how to make the Chicken and Black Bean Burrito Bowl. 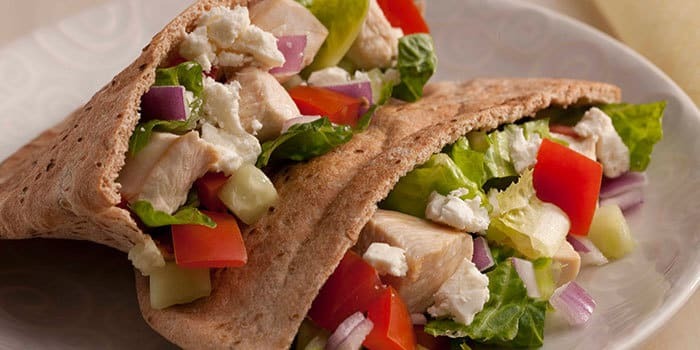 Find out how to make the Greek Chicken Pita recipe. 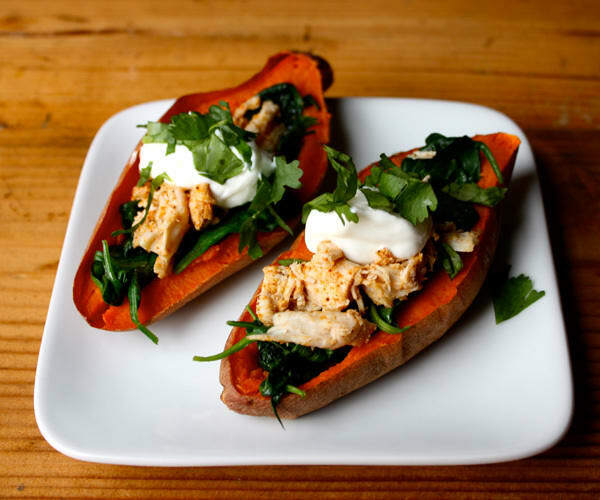 Find out how to make the Sweet Potato Skins with Chicken and Spinach recipe.